Wed, May 24th 7:30 a.m. to 6:45 p.m.
Shopping and buggy rides in the quaint town of Jamesport followed by a family style lunch at the Gingrich Dutch Pantry. 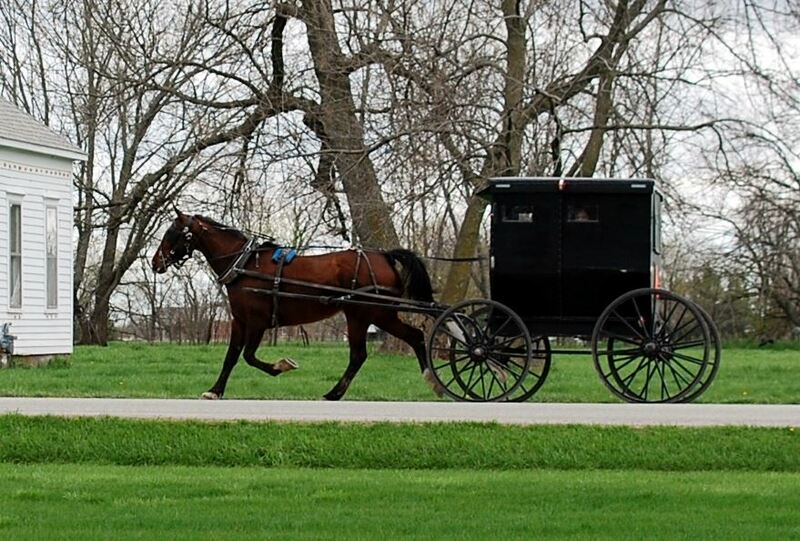 After lunch, enjoy our guided tour to the countryside to view all the springtime farm festivities of Amish Living. 7:30 a.m. Departure on a 54 passenger Arrow motor coach from the backlot of Seniors on the Move's office at 1245 8th St. in West Des Moines. Rest stop just over the Missouri border. 10:30 a.m. Arrive at Jamesport City Hall. Time for shopping and site seeing on your own before lunch. Clyde the Clydesdale with his beautiful 9-passenger Limo Carriage will be on hand to take those who want on a ride through town. (Included) Myric will be the driver. Note: you can take pictures of the buggy ride, but not Amish people. Also, most stores in Jamesport do not take credit cards, but will accept checks. 12:30 p.m. Lunch served: Fried chicken, roast beef, homemade pies, and much more! 1:30 p.m. Board the motor coach with our guide, Myric, as we visit several Amish Farms and country stores. 3:40 p.m. Return to Jamesport to stretch and grab an ice cream cone or glass of wine before heading back. 4:15 p.m. Leave Jamesport with approximate time of arrival back in West Des Moines of 6:45.